Around 1950 the Belgian artist Armand Massonet created a series of ten tourist posters for the Belgian railways. Every poster featured a city or a region — from Flemish art cities to Ardennes villages. Massonet was a master of easy and sketchy recordings of light and movement. Despite large differences, the poster series formed a peculiar unity. Railway motifs only rarely appear on the posters. Massonet's subject choices were sometimes daring, including a naked woman and industry fumes. His painting techniques in watercolor or gouache were also quite experimental, with rough brushstrokes and unusual perspectives. Massonet avoided tourist clichés such as blue skies. He was, however, inspired by romantic landscape painting. 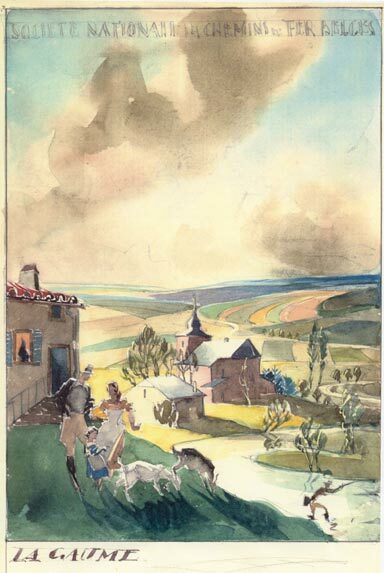 Armand Massonet (1892-1979) was originally a teacher. As an autodidact who liked to sketch in the Brussels streets he attended evening classes at the Academy of Fine Arts. During the First World War he was deployed at the Yser front as an army painter. He also made the illustrated 'La Claque à Fond' soldier magazine. 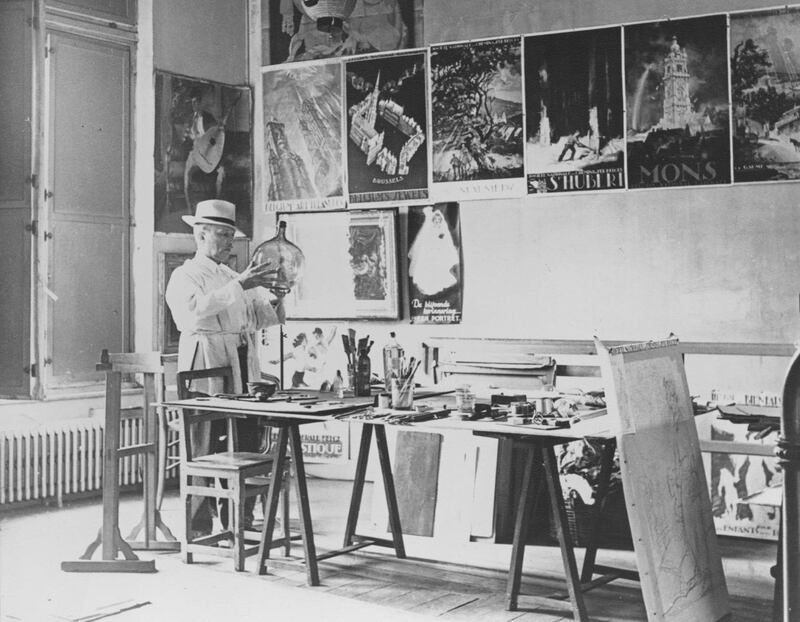 During his leaves Massonet took lessons at the École des Beaux Arts in Paris with Fernand Cormon, who had taught Vincent van Gogh and Henri de Toulouse-Lautrec. In this period he created his first posters for war victim and veteran relief campaigns. Between the wars Massonet worked as a drawing teacher and pedagogue, developing his own drawing method and textbooks. At the same time he was a successful painter of portraits and cityscapes and a poster designer for art exhibitions and the Brussels fair. 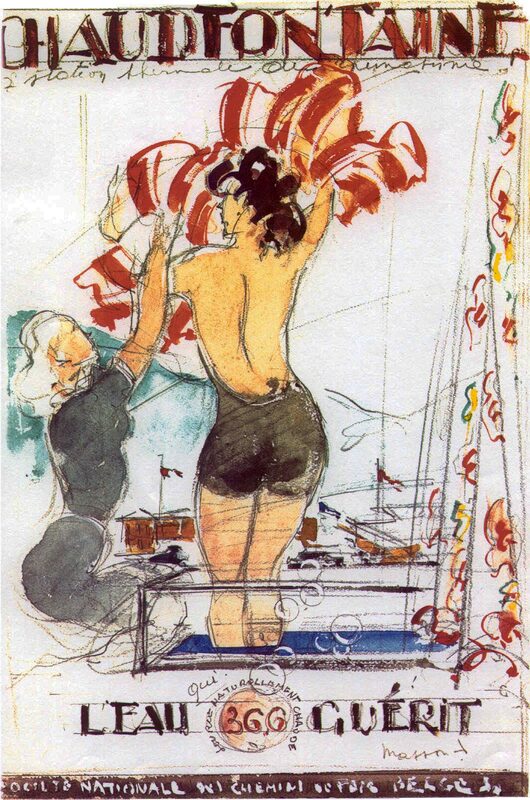 In the next decade he made fashion posters and popular paintings of jazz bands and dancers. After 1945 Massonet quit teaching to devote himself entirely to art and design. He regularly stayed in Paris in the circles around French painter Maurice de Vlaminck. Massonet now also designed commercial posters for Agfa-Gevaert and graphics for Philips. In these years he created the tourist posters for the Belgian railways. It wasn't his only commission for the railways: he also produced a large painting of a railway worker and illustrations for a staff manual. The ten posters — a sketch for an eleventh one was never executed — were issued in French, Dutch, German and English. The dimensions were 62x100 cm and the circulation was around 1,500 to 3,000 per poster. They were probably also displayed at railway stations in neighboring countries. In the family archive sketches and photographs are kept that show the development of the designs. Massonet also explained his way of working in publications. Almost everything is happening outside, and so it is with the placard. Whether it is in Tournai, La Gaume, Malmedy or St-Hubert, one creates it outside and finishes it inside by walking around it a hundred times. Do not be afraid to stay in the landscape for fourteen days if necessary, to speak with the people, to ask questions and to sketch everywhere. A bird that flies around always finds something. A placard does not arise from the dark room. One has to use surreality, connect impossibilities and retrieve the image from 'nothing'. Then it is time to produce the placard, and here you need common sense. Since it is intended for everyone, the public must be enabled to contribute its part... Because the public puts the finishing touches to your poster. That makes it happy and it will embrace you as a rare good, a falling star, a meteor! The placard must be like a song, a simple poem, written for everyone, but in an exquisite and refined way, because it has to please all layers of society, from the front row to the upper balcony. 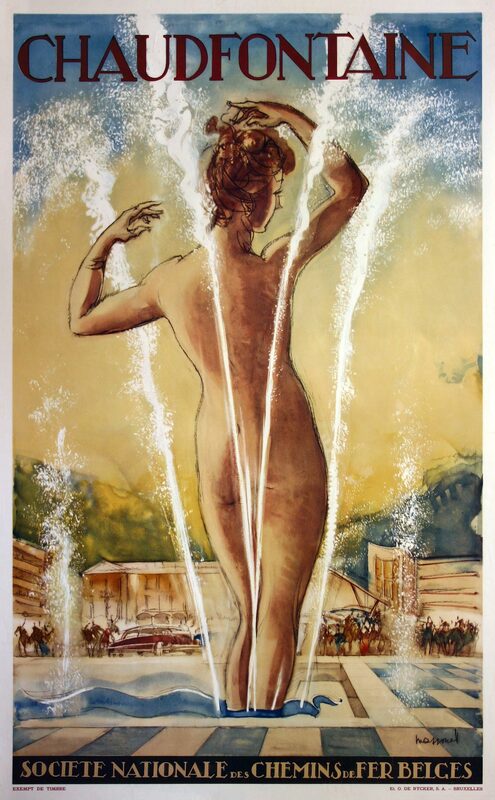 Armand Massonet's first poster for the Belgian railways was probably the 1948 one advertising the Walloon spa of Chaudfontaine. It is possible that the artist initially designed it for Chaudfontaine's casino management, and when they did not like the design, he might have offered it to the railways. A naked woman, seen on her back in one of the thermal baths of Chaudfontaine, constitutes the main motif. She arranges her hair while enjoying the refreshing water jets. In the background Chaudfontaine's casino building is shown with silhouettes of visitors and their automobiles. The poster was daring for its time and did not go unnoticed. Although the woman is seen on her back and water jets conceal the details, the railways received a letter from a Chaudfontaine priest who complained about the indecent representation. Sketches have been preserved in the family archive that show the evolution of the design. The motif of the bather always remained. However, she was originally wearing a bathing suit and was flanked by a second woman. In a subsequent design, already largely elaborated in full size, she was alone and did not wear a swimsuit but a towel. The third design without towel or suit is similar to the final poster. The Gaume in Belgian Lorraine near the French border is the warmest region of the country. Tourists appreciate the Gaume because of 'a touch of Provence'. Massonet depicted the southernmost village of Torgny, known for its crickets and southern flora. The houses with orange tiled roofs are leaning against the hills. According to Massonet the entire color scheme of the poster was based on the color of the stones. In the front of the idyllic scene chickens are scrabbling around, while a farmer and child are guiding a cow to the barn. Two women are talking to each other next to a cart and a man is enjoying the sun in front of his house. In the background sunbeams break through the impressive clouds above the green Meuse valley. The black text area at the bottom shows a map of the Gaume and its surroundings, including Northern France and Luxembourg. A schematic silhouette of a train is also depicted. As on all of the posters the letters were hand-drawn by Massonet. A preserved preliminary design is much emptier than the final result: it has almost no trees and fewer houses, but does show a church. In his book L'aquarelle, which was issued in Paris in 1956, Massonet described the making of the poster. 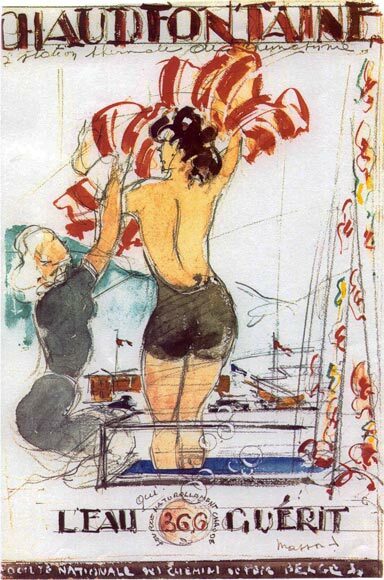 In seven pages, illustrated with sketches and details, he discussed all the steps — including the wetting of the watercolor paper and the arrangement of the easel. Make your first tour d'horizon accompanied by the song of the crickets. Breathe in the fragrant land with its flowers and ripe fruit. Follow the game of the clouds. Ride the countryside, jump over the fences, to La Ramonette and France. Gently take the landscape but without barriers. Listen to the friendship of things. The picture, the tourist poster, will come out later, in the studio and by heart. See Marville with its houses in ramparts, the frontons as eyelashes above the doorways, and further down Avioth with its basilica 'La Recevresse' lost in the countryside, galloping back across the border to Torgny, our subject, to understand this isolated piece of Provence in the North. Round roof tiles, gates dating back from 1563, 1695, carved out of the warm, red and soft stone that makes you want to become a sculptor. This stone will determine the tone of the poster. 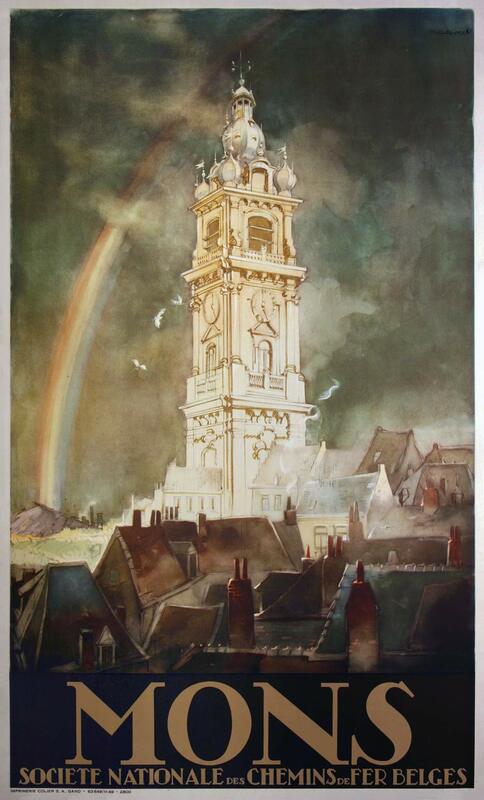 The Walloon city of Mons was represented by Massonet by its belfry, the monumental bell tower that dominates the city. This 17th century building is the only Belgian belfry in baroque style, of which the 'excessive' features are clearly visible on the poster. The tower is 87 meters high and houses 49 bells. The dark cloudy sky — not quite a recommendation for tourists — is characteristic of the artist. It looks like a heavy thunderstorm has just passed by; the tower is bathed in sunlight again while a rainbow breaks through the clouds. White birds fly around the tower. The roofs and chimneys of the houses in the foreground are still dark. 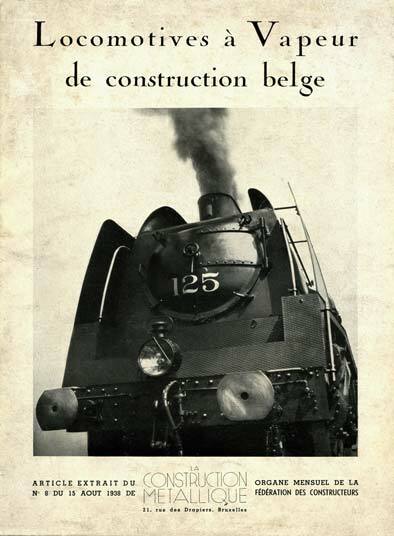 The name Société Nationale des Chemins de Fer Belges (in French or another language) is present on all posters, but only on this one it is at the bottom. Pre-designs in the Massonet archive show that the artist first tried more caricatural views of the belfry, but opted for a realistic rendering in the end. A preliminary study also shows that Massonet first envisioned the dark sky as light yellow, and the tower as a dark silhouette. The final result is reversed and therefore more impressive. This is the only railway poster from Massonet’s series that can immediately be recognized as such. It does not highlight a specific city or region, but rather the connection between two cities. 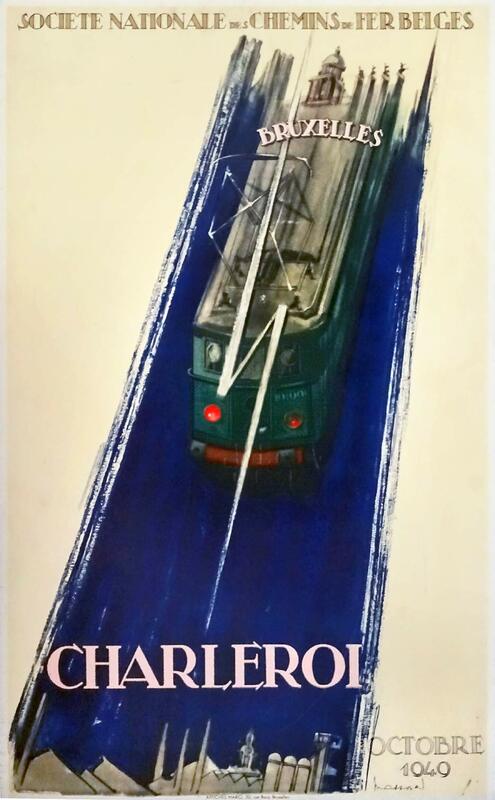 The poster was designed on the occasion of the electrification of the 55-kilometer railway line between Brussels and Charleroi, which was completed in October 1949. An electric locomotive dashes from one city to another along a wide blue track. The diagonal direction, the blurred 'moving' parts and the ragged edges all suggest speed. The overhead line is shown as a lightning bolt, a symbol of high voltage. At the top the track morphs into the contours of several Brussels buildings such as the dome of the Palace of Justice. 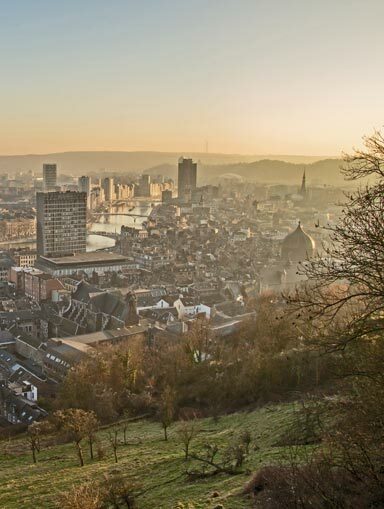 At the bottom the trajectory ends in the industrial skyline of Charleroi. 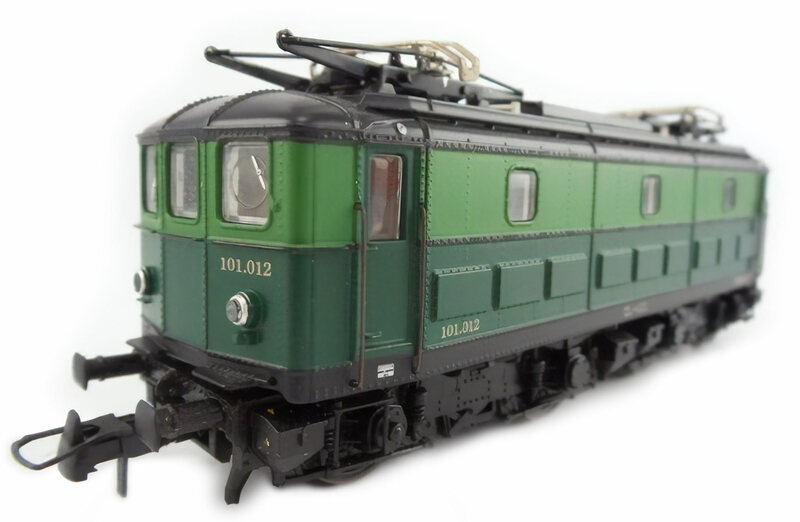 The depicted locomotive 101001 of the 101 type was the first electric one in Belgium. The series of twenty engines was built in 1949 by Baume & Marpent, inspired by the French BB 300. They were used until about 1980 for freight and express trains, initially on the Antwerp-Brussels-Charleroi line. The green locomotives were recognizable by the round 'portholes' in the rectangular front windows. 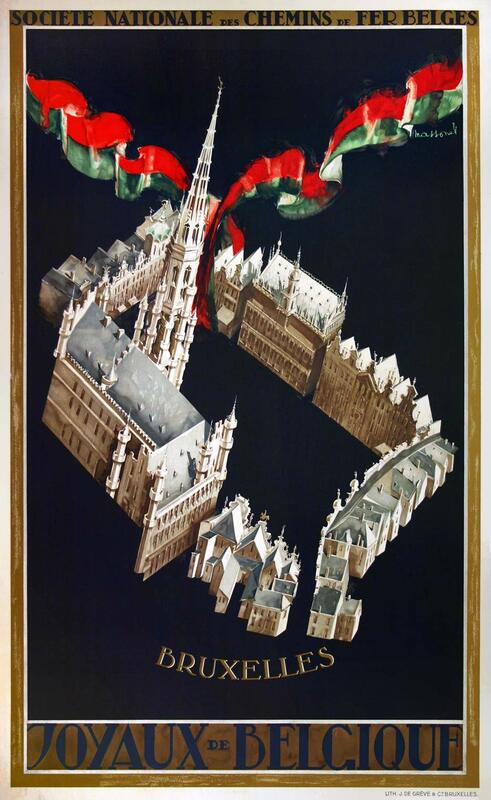 The poster of the capital of Brussels was one of the most successful of the series. It features a bird's-eye view of the famous Grand Place against a black backdrop. This uniform color was unusual for Massonet, who normally excelled in heavy clouded skies and other rich textures. The frame in gold ink contrasts nicely with the black plane, just as the gold lettering. The Town Hall, the Maison du Roi and the guild houses surrounding the square have been cut out of their surroundings like model village houses. Like a pendant of a necklace they hang from a winding ribbon in the colors of the Brussels flag. Perhaps the artist intended to create an almost literal depiction of the caption Joyaux de Belgique, or on the English version: Belgium's Jewels. 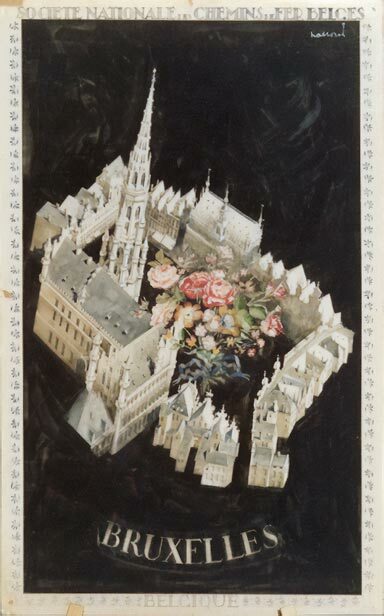 According to family memories Armand Massonet based the Brussels poster on an aerial photograph of the Grand Place. One of the preliminary designs in gouache from his archives shows the same bird's-eye view, albeit without a ribbon and instead with a large flower bouquet in the center. It was probably a good decision to leave the flowers out. 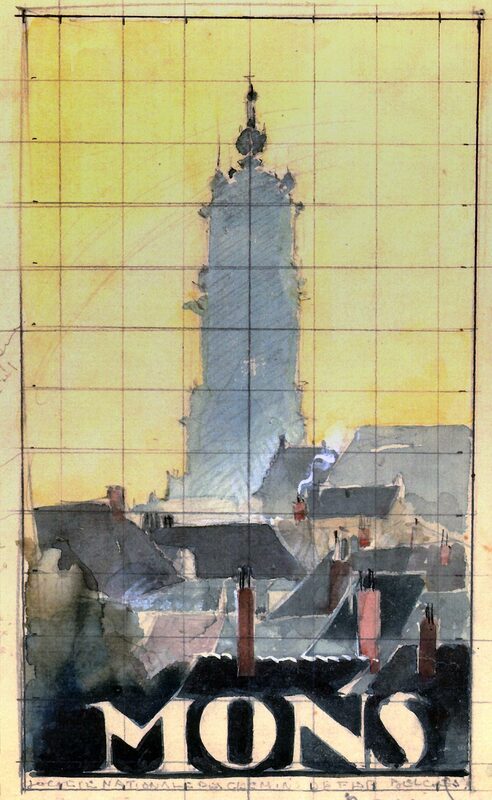 Vue d'optique vers le ciel ou point de vue aérien… Tours sur ciel d'or — or a perspective view of towers against a golden sky, as Massonet himself described his monumental poster of Tournai, a city in the province of Hainaut. The five impressive towers of the Notre-Dame de Tournai cathedral fill the poster diagonally from bottom right to top left. The view is similar to the effect of a wide-angle lens, and there is a good chance the artist did create photographs in preparation. They have not been preserved, but similar photos of churches in other cities have. 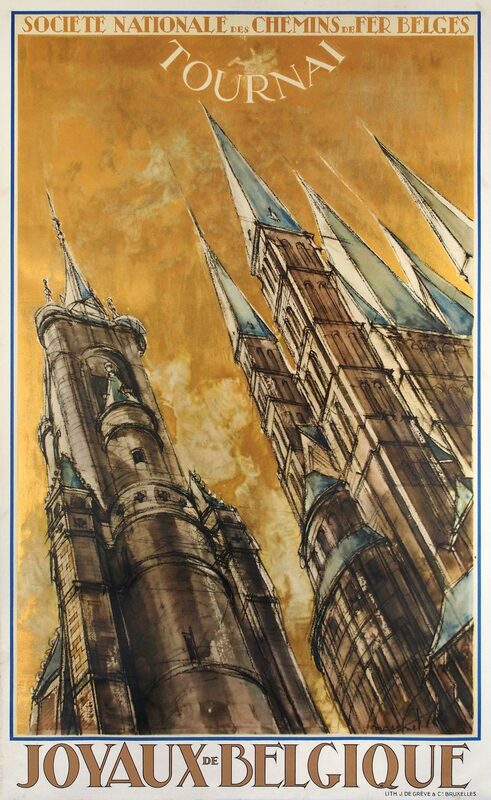 The pointed towers stand out against a golden sky that was printed in expensive and glossy metallic ink. The lettering on a light background was printed the same way. As on the Brussels poster the caption is Joyaux de Belgique (jewels or gems of Belgium). The English-language version of this poster reads Belgium's Art Treasures in this case. 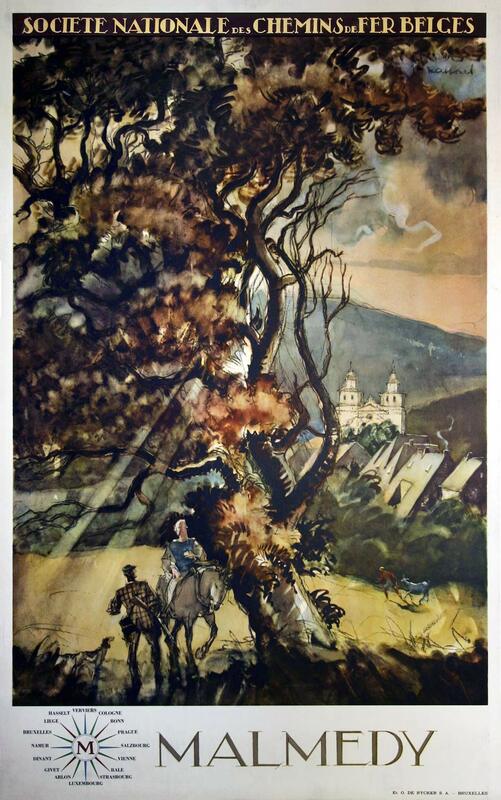 Pre-designs in gouache for the Tournai poster from the family archives show that Armand Massonet first tried several traditional city views. The final design, although still very sketchy, strongly resembles the final poster, including the sharp spires and the golden sky. A design similar in approach to the Gaume poster advertises the town of Malmédy in the east of the province of Liège near the German border. A large tree is in the center of a pastoral scene; beams of sunlight are falling through the leaves. 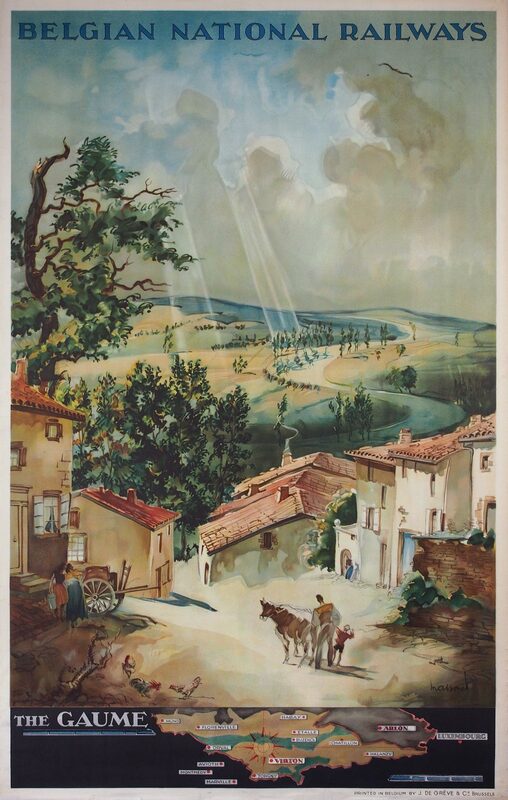 As with most Massonet posters the cloudy skies are an integral part of the landscape. At the bottom left a hunter with his rifle and two dogs chats with a horseman. On the right of the tree we see a young farmer in shorts pulling a goat. Behind him the roofs of Malmédy's houses rise up, along with the two iconic towers of the 18th-century former abbey church. The autumnal colors, the huntsman and a smoke plume from a chimney suggest we are looking at an early autumn scene. 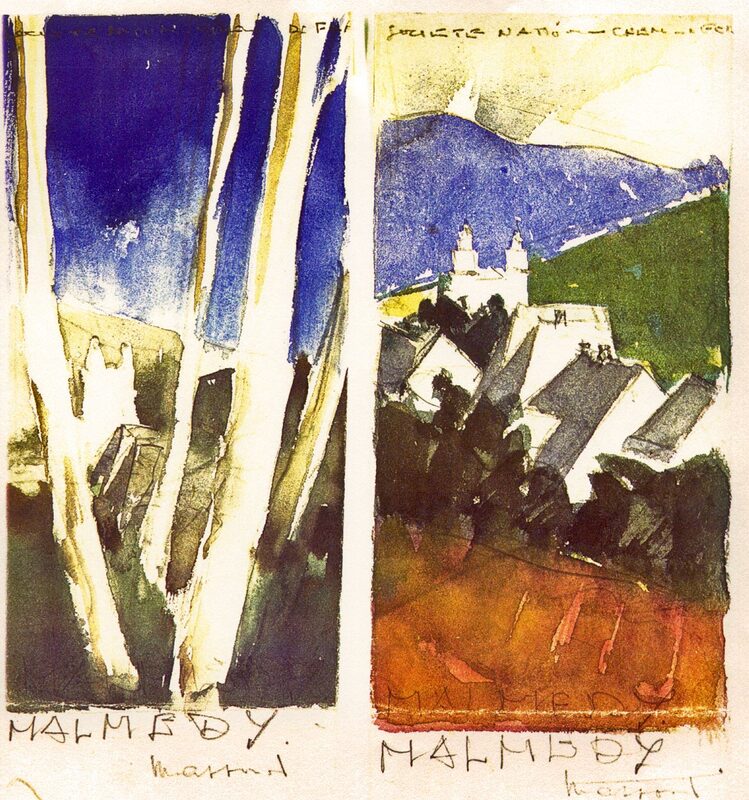 Two of Massonet's preliminary gouaches for the Malmédy poster have been preserved. One has trees as its main motive; in contrast to the tree on the final poster they have straight trunks and no branches or leaves. 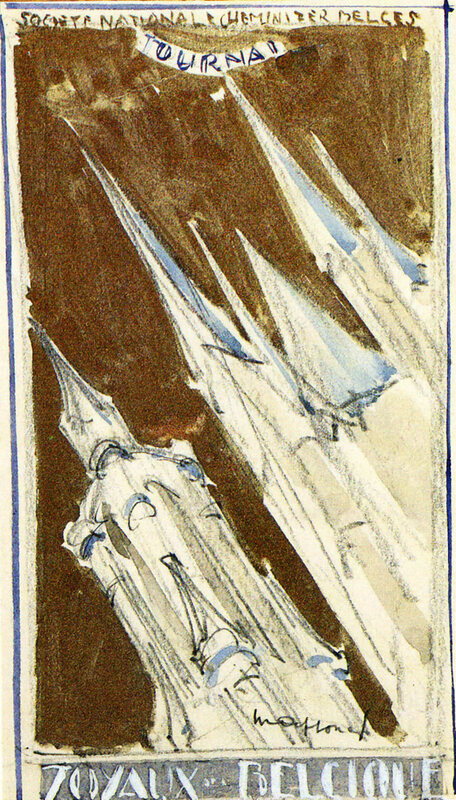 The other sketch shows the houses and two-towered cathedral exactly as they would end up on the right side of the poster. 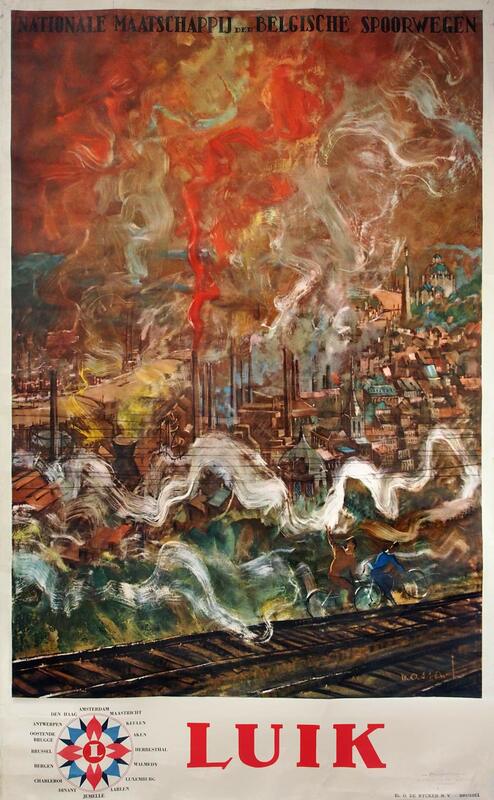 One of the most remarkable posters of the series depicts the Walloon city of Liège. It is an ode to the heavy metalworks industry along the river Meuse. Between the churches and monuments on the hillsides there are numerous factories with chimneys spewing out big clouds of red and gray smoke — they remind of the sulfur hellfire on Hieronymus Bosch paintings. Massonet painted the scene with rough brushstrokes. For today’s tourists, the thick brown blanket of smog above the city certainly would be no recommendation, but in 1950 it probably suggested vibrant economic activity. At the bottom there is a railway above which a swirling white steam cloud fills the entire width, standing out against the dark industrial vapors. The steam subtly suggests that a train just ran out of view. 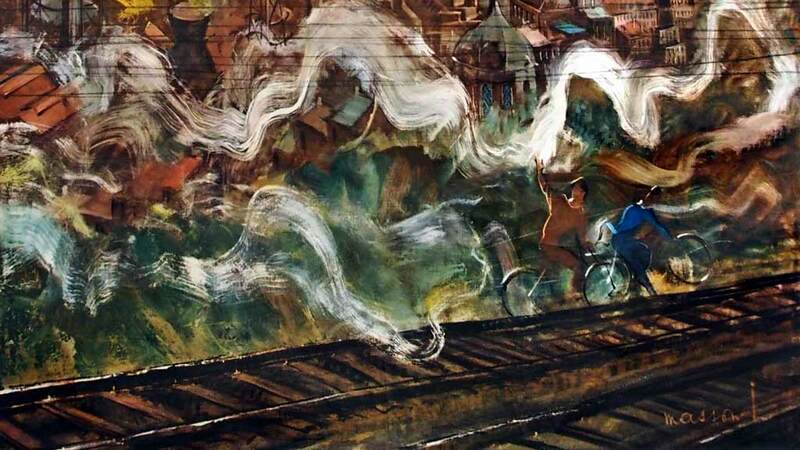 Two young cyclists are cheerfully waving the train goodbye, not bothered at all by the toxic fumes or the dangers of cycling along the tracks. The white border at the bottom features the city name along with an elegant compass rose that shows the location of Liège relative to several Belgian, Dutch and German cities. Between the chimneys the Église Saint-André and the Cathédrale Saint-Paul can be recognised in the front, as well as the Mémorial Interallié with the Église du Sacré-Cœur on the right part of the background. The river Meuse crosses the image diagonally. 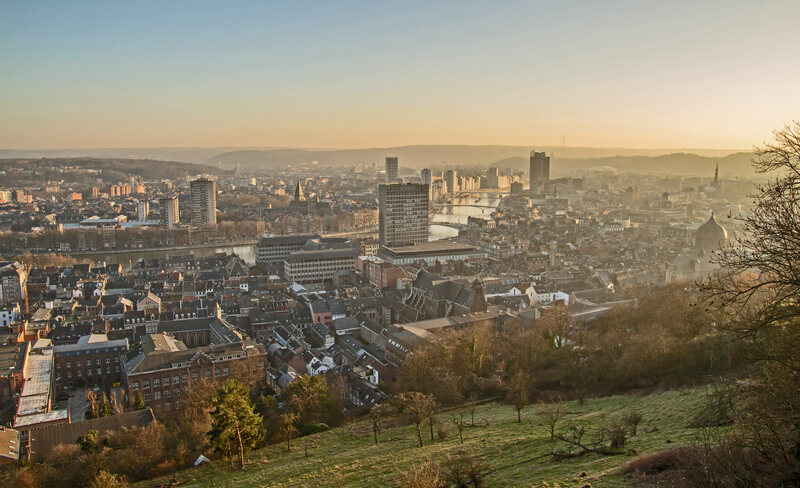 The viewpoint can be situated on the citadel hill above the Liège-Palais railway station. Here the tracks run through two tunnels, making it actually impossible to cycle along. This poster advertises Saint-Hubert as a destination for a train trip to the Ardennes. The town in its wooded surroundings is known as a center of tourism and hunting. Its name giver, Saint Hubert, is the patron saint of hunters. 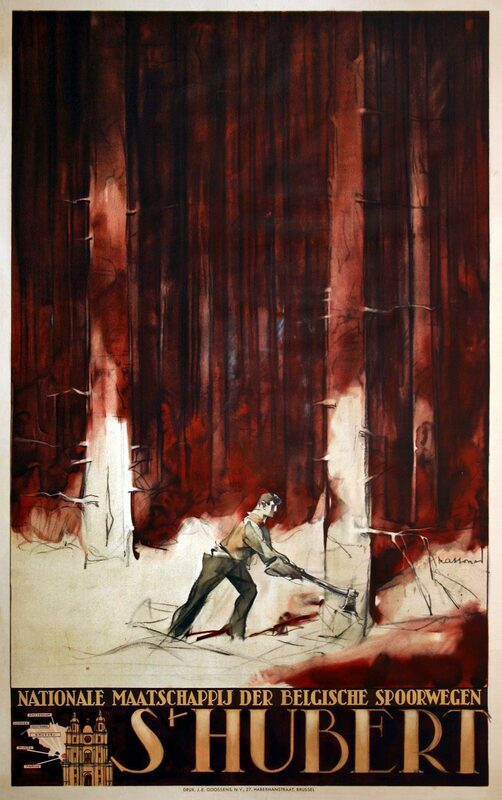 The poster takes us to a dense coniferous forest with high trees in brown-red colors and a lumberjack working in a sunlit clearing. A map is at the bottom showing the (inter)national railway connections and a small drawing of the Saint-Hubert Basilica. To prepare for the poster design Massonet visited the Ardennes forests several times. He recorded his first impressions in small sketchbooks and also took photographs. The artist elaborated on this material in his studio. Preserved preliminary studies in watercolor show that he depicted a wild boar at first, and subsequently a deer, instead of the logger. In the end he decided for a human subject. 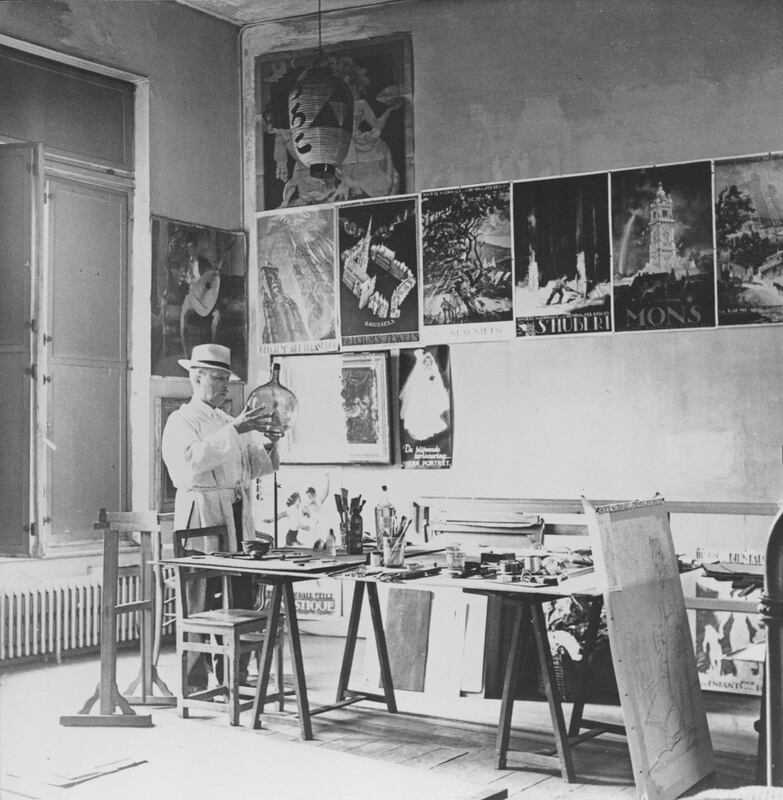 Black-and-white photos preserved in the painter's estate provide an interesting insight into his working method. 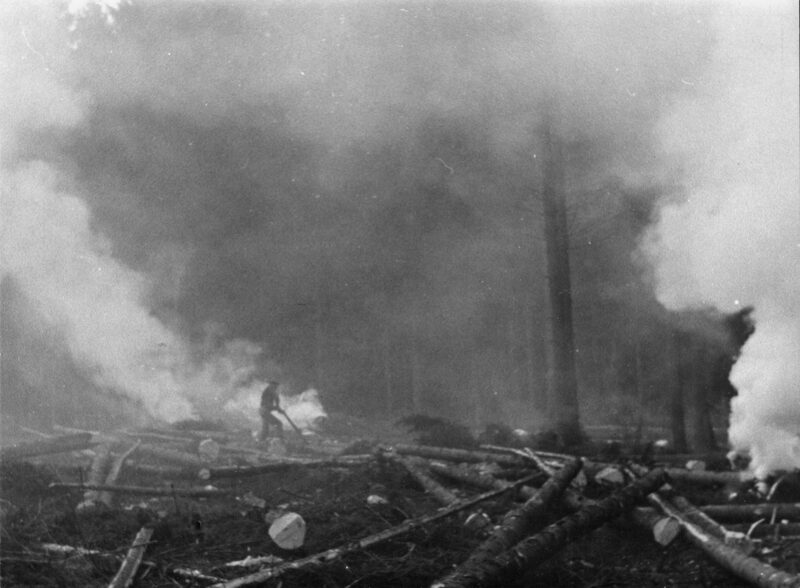 He photographed the tall straight pine trees in the forest as well as the loggers at work. 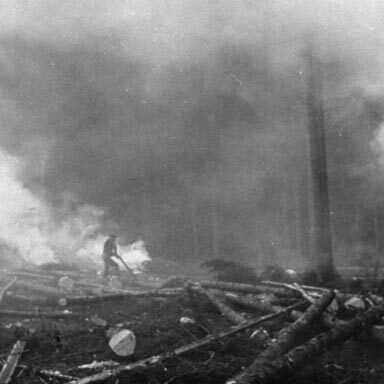 The heavy smoke visible in the photographs, perhaps from the burning of tree stumps, was left out on the final poster. Massonet did not copy the photos directly but used them as documentation and source of inspiration. The 'In Belgium' poster can be regarded as a recap or final piece of Massonet's tourist railway poster series. It shows the most important architectural gems reflected in the shiny front of a steam locomotive. We can recognise, among others, the belfry of Bruges, the cathedral at Antwerp and the Brussels city hall, along with an equestrian statue in the front. All the highlights were condensed into a single image to entice foreign tourists to take the train to Belgium. Compared with the other posters the approach is experimental, and not only because of the perspective. 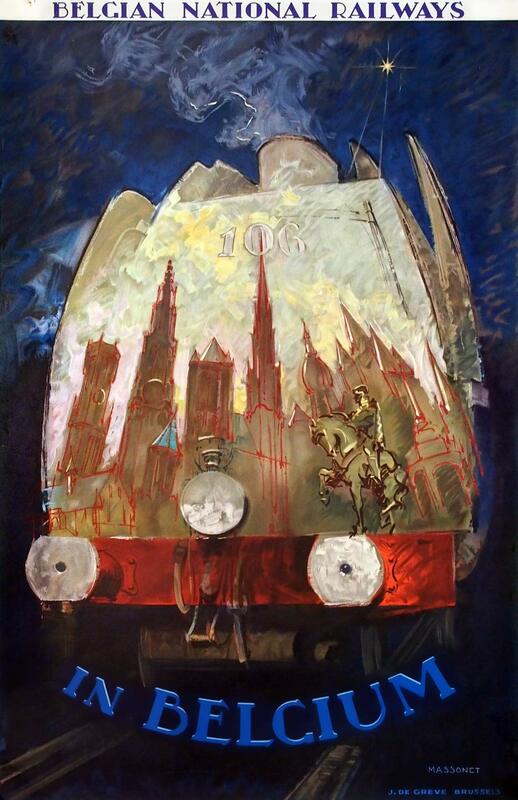 The perfect reflection on a locomotive that was not that smooth in reality, as well as the skyline composed of different cities, are almost surreal. Moreover the equestrian statue seems to stick out. The frog's perspective renders an almost spherical image, as if we are looking through a fisheye lens. The engine can be recognized by its buffers, headlight, wind deflectors and locomotive number 106 (renamed 1006 later). It was an express engine of the type 1 'Superpacific' class that was used between 1935 and 1962. An industry magazine featured a cover story on these Belgium-built locomotives in 1938. Massonet's view is very similar to the cover photo, although the poster artist moved the locomotive number upwards to give the skyline more space.